Parker Buckley took Mike, Connie, Tim, his wife (Carol Young) and me out to breakfast in downtown Yellow Springs (everything in this progressive little town is mere blocks away). Afterwards, pedaled down to Main Street to see what kind of interest I could generate in the 100% by 2020 goal. Almost everyone I met (thanks for the contribution, Ray Owens) wants to see this happen for America. Dropped into a great environmental shop, Eco-Mental, where the owner, CJ Williams, was so into the ride she not only donated an upgraded solar-powered charger for my iPhone, but offered to mail my old one home. Thanks, CJ! Learned more this morning about the beautiful bike trail I enjoyed yesterday, and will be riding on again today. Between Connie and Mike (who’s been a dedicated biker for the past 42 years), they sit on the boards of several bike trail advocacy groups, including Friends of the Little Miami State Park (www.flmsp.org), that make it possible for people to bike safely from Cincinnati to Springfield and beyond. Every state in America needs a bike network like this, so please support your local bike advocacy groups! 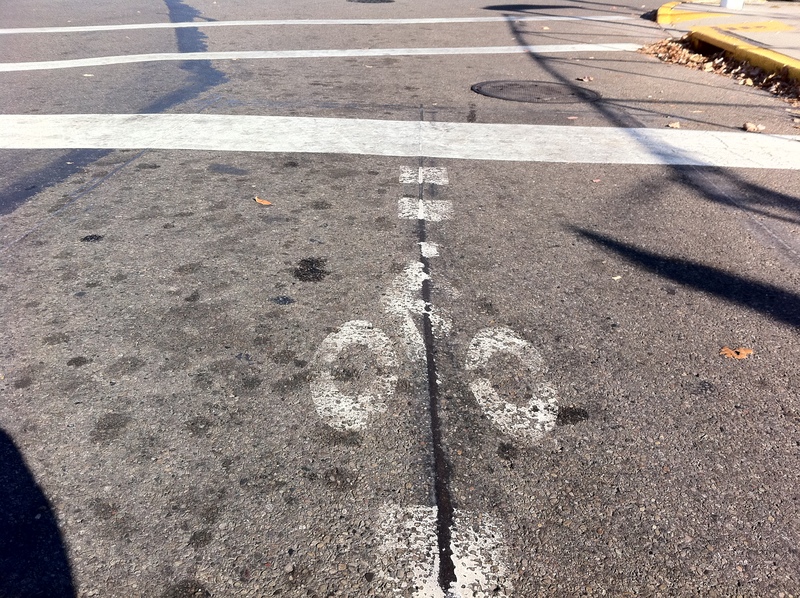 Also saw something really cool in Yellow Springs that I’ve never seen before: a strip in the pavement where you can trip the stoplight by rolling your bike onto it. In the afternoon, Mike and Connie rode 12 miles with me up the trail to Parker and Carol’s house in Springfield. On the way out of town, visited some beautiful straw bail houses being built, which are starting to pop up all across America. They’re elegance is their simplicity. 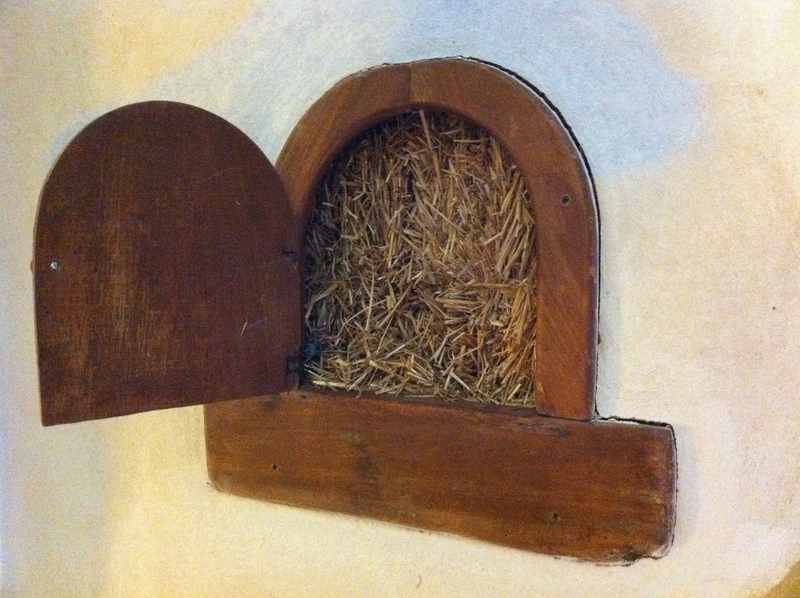 In the houses Andy Holyoke builds, he adds what I believe he called a “truth window” to each house so anyone can see the actual straw that is behind the stucco walls. Really neat. Then we rolled over to the state’s first passive house, currently under construction. 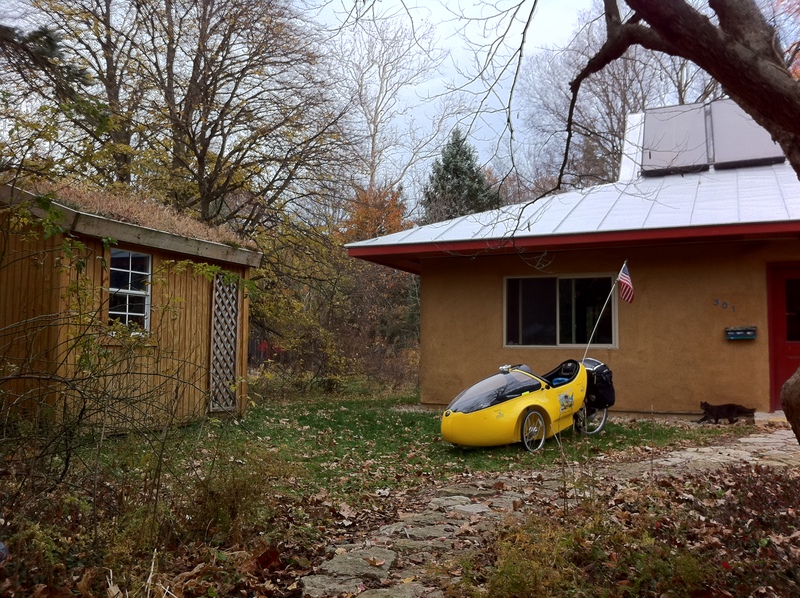 Passive House is the most rigorous energy standard in the world and a product of decades of German engineering (how fitting, given that I’m riding a German-made trike). For every $100 an average house spends on heating and cooling, a Passive House will spend only $10. That alone should be enough to create a mass market for these kinds of homes in America. Near our destination, a stream of crows suddenly appeared in the sky, and kept going, and going, and going. There were thousands, possibly tens of thousands, of crows all headed towards downtown Springfield. Mike told me they do this every night this time of year, attracted by the “heat island” effect of the city. I’ve never seen so many crows in my life. It was really astounding. If I had the time, I could have filmed them for probably an hour. Later, Parker and Carol treated me to dinner, a chance to clean my clothes, and some quiet time to catch up on my blogs. Parker’s beautiful dulcimer playing made the evening complete. Pedaled a mellow 17 miles today, including side trips. 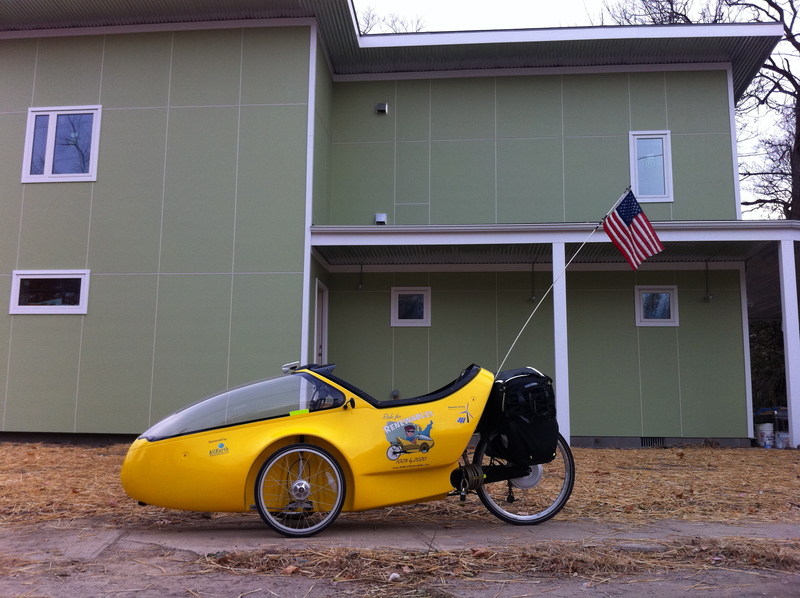 This entry was posted in 2010 Ride, Blog, Video and tagged crow migration, friends of the little miami state park, passive house, ride for renewables, straw bale, yellow springs. Bookmark the permalink.